This is Part 4 of the four part series on writing an ebook and related obstacles. There are a number of obstacles, real or perceived, that block the path to writing an ebook. But, even if you get past those obstacles and have an ebook available for sale, this is only the beginning. You still need to attract customers and build on your initial information product. Creating an ebook can be considered the first step toward your information product empire. 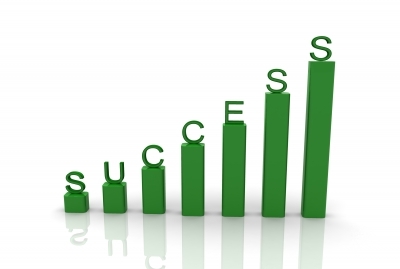 The next step to creating and building a business is generating and sustaining momentum. This relates to the marketing end of your business. This is the same strategy for any product you’re selling online. It’s kind of like Marketing 101. You need to make people, the right people, aware of your product and make it appealing and valuable enough for them to want to buy. Its value has to be greater than its opportunity cost. So, what are the steps needed to get your ‘information product business’ up and running? First and foremost, know who your target audience is. You’ll need to know what problem they need solved, or what question they need answered, or what roadblock they need to overcome. Knowing this will help you structure all your information products. This is a must for any business. It will help guide you through to a successful business. It establishes focus and clarity, which will motivate you and keep you motivated. For any business, online or offline, you need a website. This is your online office - the place where people can learn about you and your products - the place where you develop a relationship with the visitors. When considering a website marketing expert Mike Volpe of Hubspot.com points out that it’s more important to spend time and money on content, rather than a flashy website design. The idea is simple works. In fact, simpler has been proven to lead to a higher conversion rate. To reinforce the ‘simple is better strategy,’ Google says that milliseconds count in regard to your page load time. If your page is slow to load, you’ll get a poorer score with Google. And, marketing studies are finding that cluttered or flashy designs are distracting to visitors, which is another factor in reducing conversion. Volpe also advises that you should have control over your site. This means you should be able to manage it yourself. So, keep this in mind when hiring a website creator/designer, if you’re not doing it yourself. If you think of a business as a house, your subscriber list will be the foundation. Without it you can’t build anything. Building your list involves having an opt-in box and it’s advisable to have a specific landing page for it. Having the opt-in only on your website’s sidebar leaves too much room for distraction. Have your article marketing endeavors link to your opt-in landing page. To get visitors to give you their precious email address, you’ll need to have a great free offer. This can be a report, an information ebook or podcast, or even a webinar replay. Provide a quality information product freebie. The freebie needs to be valuable enough for the visitor to see its perceived value. In order to keep your subscribers happy, you’ll need to provide regular information emails. This can also be in the form of a newsletter. An effective and organic strategy for driving traffic is article marketing. The idea is to create an information funnel leading traffic back to your site. Other options include: Joint Ventures (JVs), social media, and buying traffic, such as ‘pay per click’ (PPC). There you have it, five steps to creating your information product empire foundation, beginning with writing an ebook. Want to create an effective money-making ebook in 7 days? If you said yes, then you’ll want to check out How to Write Your Own Ebook in 7 Days by Jim Edwards. 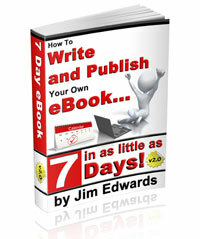 Get your copy of How to Write Your Own Ebook in 7 Days and get started today. CLICK HERE!